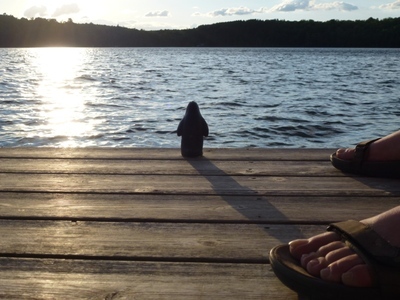 Pierre the Penguin, an unofficial Governors State University mascot, posed lakeside on a pier in Wisconsin. The photo was announced as an honorable mention winner in the article "And Now, the Winners" on pp. 4-5 of the November 26, 2012 GSU View.